Stonehenge, found in Wiltshire, England, is a prehistoric wonder of huge stones set in a ring formation. This mysterious stone formation remains a big tourist attraction and in 1986, it was added to UNESCO’s World Heritage site list. 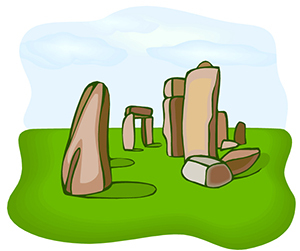 It is believed that Stonehenge was built between 3000 BC to 2000 BC; this would make it about 5000 years old! The myths around Stonehenge range from scientific to religious and we have to wonder if we will ever discover the true meaning behind the ring of stones. There are very little records with information about Stonehenge, the only information we have about Stonehenge is thanks to scientific and archaeological research. Another mystery about Stonehenge is how the builders of this monument actually transported the stones as they are absolutely enormous! There are many similar places to Stonehenge with the circular rock formation. Stonehenge is one of over 1000 stone circles in the United Kingdom. There is a huge sandstone alter that stands in the middle of the monument and this weighs 54000 kilograms! Transportation of these heavy stones would have been very difficult during this time and it is thought that wooden boats along the river would have helped move them or even primitive sleds that were made from tree trunks. 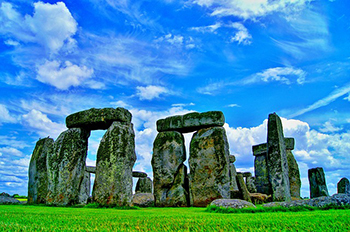 Stonehenge is a popular tourist attraction and also hosts special events and ceremonies. A brand new visitor’s centre was built for Stonehenge in 2013. Even thought we do not know exactly who built Stonehenge, whoever they were knew their maths! It was built with incredible mathematical precision as the circle matches the direction of the midsummer sunrise and midwinter sunset (winter and summer Solstice). It also is precisely matched to the movements of the moon. Some of the archeologists who have researched Stonehenge believe that it may have been used as a calendar by the people who built it. Different types of stone make up the ring of stone. The larger stones are called sarsens and then smaller stones called bluestones as they had a blue tinge when wet. There are a total of 83 stones at Stonehenge. Thirsty sarsen stones were apparently added to Stonehenge two years after it was first built. These stones were sarsen stone and weigh about 22000 kilograms and created a new circle with a diameter of 33 meters. Some of the stones at Stonehenge have a lintel that joins them. A lintel the stone that lies horizontally across two standing stones. This type of formation is known as a trilithon. The area in which Stonehenge is found has many other Neolithic and Bronze age monuments that add to the appeal of the location. Question: What are the two different types of stone used at Stonehenge? Question: What makes up a trilithon? Question: What is one of the reasons researchers believe Stonehenge existed? Question: How many similar stone rings are there in the United Kingdom? Question: How do scientists believe they transported the stones used for the construction of Stonehenge? Copyright 2018 Science for Kids. All rights reserved.